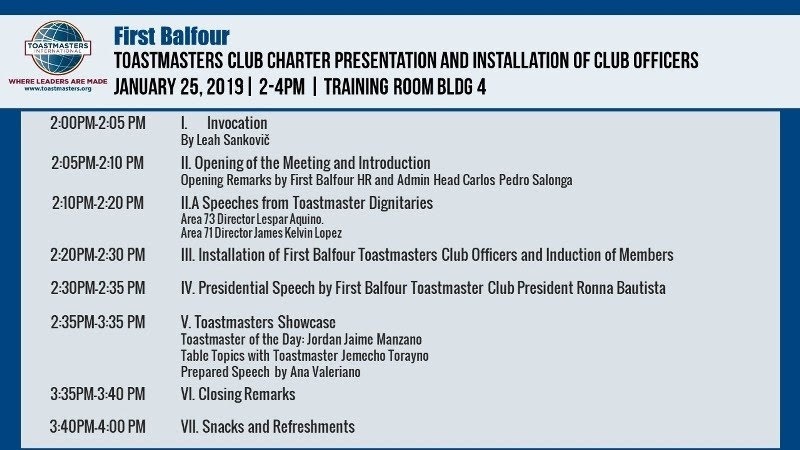 At long last, the First Balfour Toastmasters Club had their Charter Presentation and Installation today. This was a few months after we, the demo team, gave a Demo Meeting for First Balfour last Oct.26, 2018. Attending as guests in today's Charter Presentation were (L-R, seated): Area 71 Director JK, me (representing Div H Director Dolly), ACT VP-Education Lolet de los Reyes, ACT VP-Membership Estrella Coors and her guest. The club's banner was received by Division H Director Dolly just yesterday. Lolet's son NJ picked up the banner from Dolly. What great timing, I thought, that the club was able to display the banner, just in time for its Charter Presentation. Dolly was supposed to represent District Director Benz Lim who happened to be in China. But since Dolly couldn't make it today, I represented Dolly. 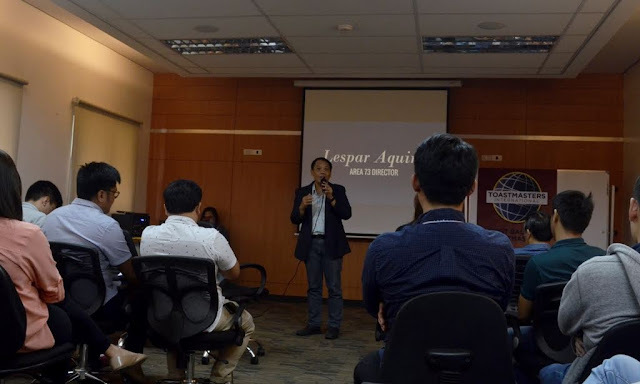 At the far right end of the photo above is HR-Admin Head Carlos "Caloy" Salonga, who gave the opening remarks. 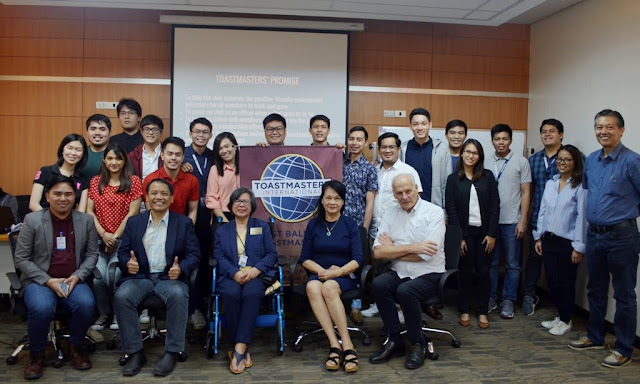 I later heard from Mam Lolet that Caloy used to be a Toastmaster. 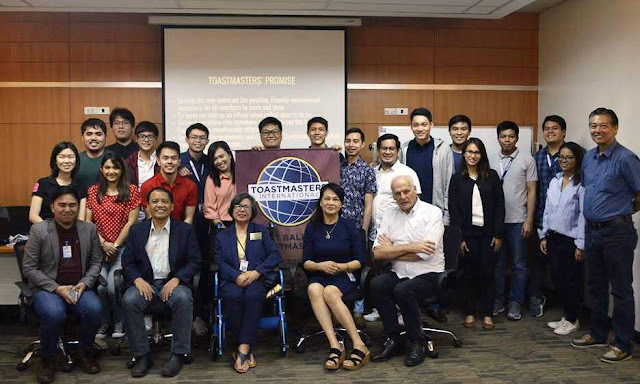 In his speech, he did espouse the benefits of Toastmasters. 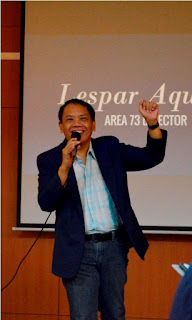 After Caloy's Introduction and Opening Remarks, TOD Jordan segued with me inducting the officers already. Based on the program, JK and I had speeches. JK is Area Director for 71 where First Balfour is aligned. But JK hasn't arrived yet. To stall a bit while waiting for JK, I asked Toastmaster of the Day Jordan if I could give "a few words", even if I didn't have a prepared speech. So I delivered a short speech to set a relaxed happy tone for the induction. My speech jumped off from the demo meeting at First Balfour, and touched on why we had a demo meeting. Finally, I thanked the new club members and management for accepting the challenge to establish the new club. 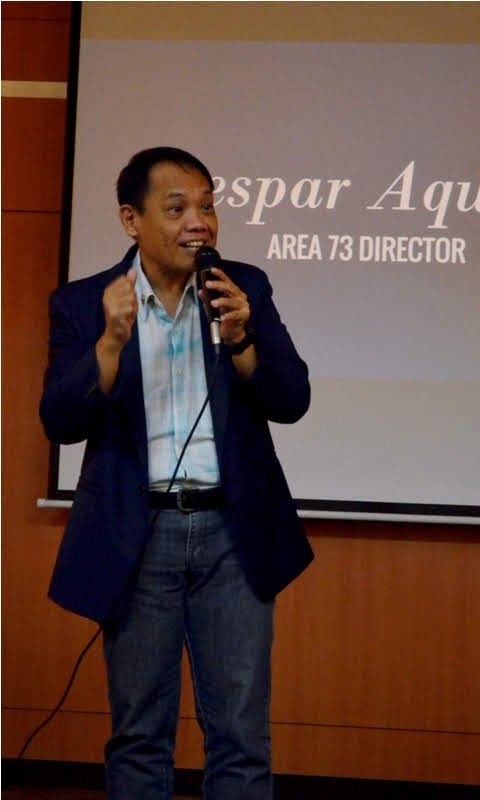 After a couple of minutes, Area 71 Director JK came. I transitioned to him with his own speech as the club's Area Director. After the short speeches, I proceeded with the Induction of New Officers. Shown below is Levin Lizardo, holding the gavel while being inducted as Club Treasurer. 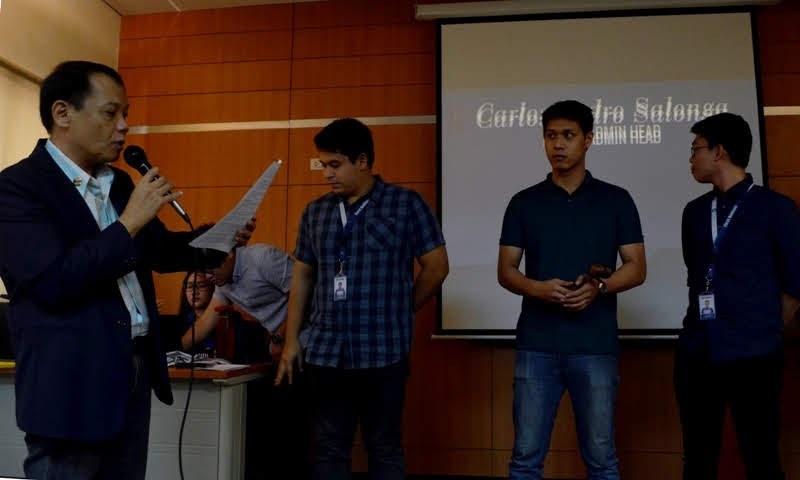 The gavel is passed from left to right, starting with Jordan Manzano as the Sgt-at-Arms (leftmost). The other officers at the induction were: Jemecko Torayno (Secretary), Lorenzo Vergel de Dios (VP-Public Relations), Renz Ferrary Macaspac (VP-Membership), Oscar Justine Cantos (VP-Education) and Ronna Bautista (President). After the Induction of Officers and Members, Caloy excused himself to attend another meeting. 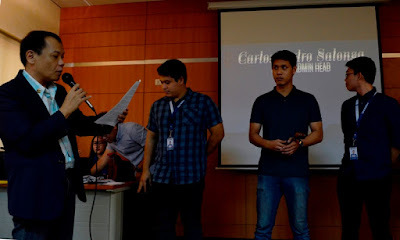 From there, we proceeded with the club meeting showcase. 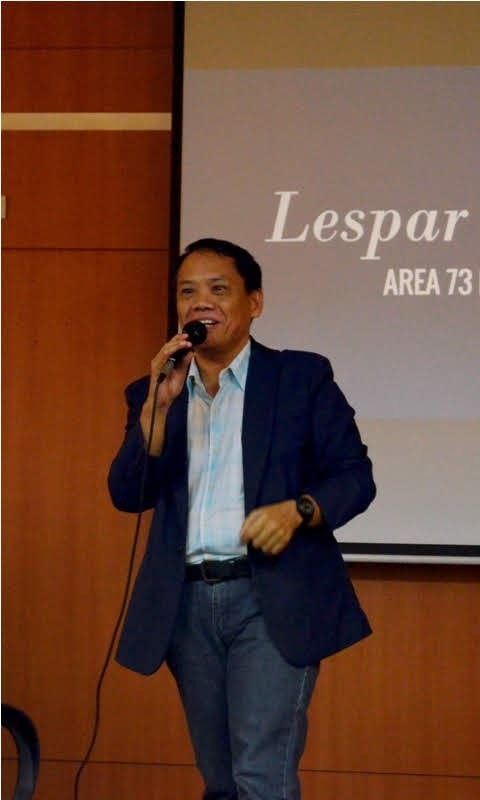 Acting as General Evaluator was Cherrie Tuazon from HR. The charter presentation and meeting were both fun and impressive. We had snacks of pancit palabok and spaghetti afterwards. Shown below is the copy of today's program.